Bill stood in the middle of the trail staring at the side of the mountain. We were at the part of the trail that broke off from day hikers into the wild. As we approached, he started talking, but never broke his stare at the slope. "Man, that'd be a great run," he said with a smiled sigh, his tanned skin creasing into deep rivers. "Isn't this just such a great place to be?" Gratitude leaked out of every word, inhale, stare. Bill was my kind of people. His eyes lit up like a child's with excitement. "I need to get out here more. It's such a recharge." We smiled broadly looking at each other. That's exactly what we call it. Before we parted ways, Bill talked fast about his plans to hike Mono Pass to Lake Thomas Edison. "They have a ferry for hikers that takes you across the lake to a prime rib dinner!" He was the last person we saw until late next morning. 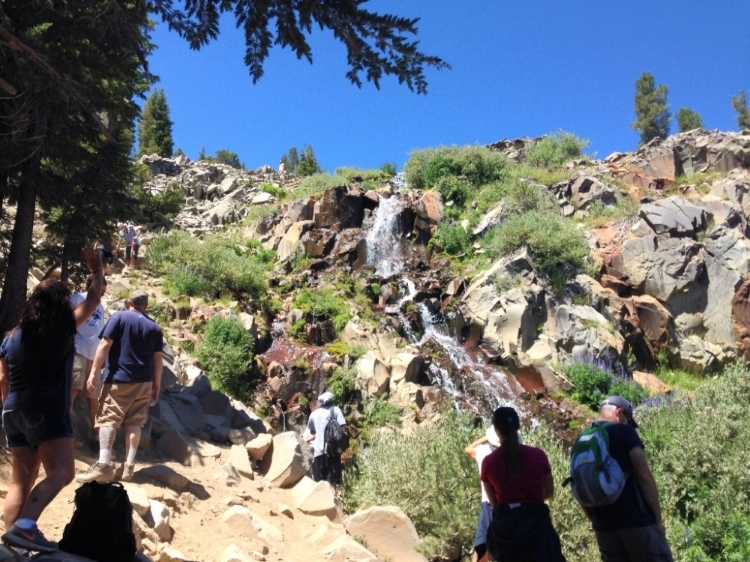 After leaving the Mount Rose Trailhead, we saw tons of people all the way to the Galena Waterfalls. Then Bill. Then no one. We headed west. The climb was gradual, but the pack made it intense. Adding 25+ lbs. to my hiking was really hard. The views served as medicine. 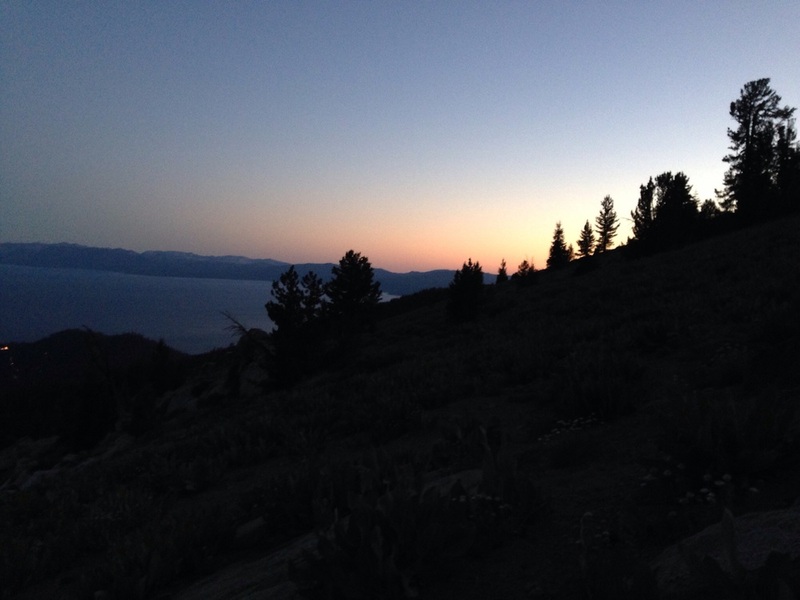 We reached the highest peak on the Tahoe Rim Trail, 5 miles from the trailhead. I felt like I had conquered a whole country. It was a rush. Adrenaline pumping, we talked fast about the next backpacking trip. "Why don't we do this every weekend?" we said, like dummies. The best of times! Look at that lake! And then our source of water ended up being bone dry. The next two lakes on the map, puddles. No water until we would reach civilization the next day. The realization that half our food for dinner needed water. The thirst that came with hiking 12 miles with lots of weight. The worst of times. Fortunately, we conserved our water until we were certain we had a water source and packed more food than we needed. Our tired weathered bodies finally stopped for the night, nestled underneath Rifle Peak, about 12 miles into our 20 mile journey. We set out to find our campsite: somewhere flat enough to sleep with a tree tall enough to hang our bear bag. As the sun set over the lake, not one single soul for miles, we looked out atop our mountain perch and couldn't believe our view. It was ours. Unbelievable beauty. We found a rock that served as a perfect sunset-viewing chair. A panoramic view of the lake and a pink-orange-blue sky. The best of times. An incredible view. One of the best sunsets of my life. There isn't much sleep involved in backpacking. This was no exception. Our "flat" spot ended up being a slight incline, and we spent the night in our little backpacking tent trying not to roll over on each other. Side sleeping made for numb extremities. Back sleeping hurt my back. Every sound startled me and I spent most of the night making mental notes of what the wind sounded like and compared it to any other sound. Our stiff bodies rolled out of our tiny orange cocoon at dawn, sleepy, crabby, craving donuts and pizza. Once we moved around a bit, our stiffness subsided and we drank in the pink sunrise, only slightly dwarfed by the memories of our sunset. Eating up most of our food, wearing our warm clothes on a chilly morning and running out of water, our packs were significantly lighter. We were on our way by 7 a.m., looking forward to an easy 8 miler, mostly downhill to our Jeep. All morning, we talked about food. What would be our first meal? I could make out Tahoe City from our view and pointed to our favorite restaurant. "There. I want that." The morning was fueled by BBQ daydreams. We stopped halfway, consuming the last of our water and two apples. The closer we got to the trailhead, the more people we'd run into. The day hiking tourists started wide-eyed at our packs and couldn't stop asking us about bears. The fellow backpackers would stop and idly chat about the trail ahead. The euphoria of hearing the road for the 1st time in 24 hours is incredible. It's jarring and foreign at first as your wild ears only consumed the wind and low grunt of bears in the trees. But the you realize you're about to finish a really hard thing. The relief and sense of accomplishment makes your tired face burst into wide smiles. I just hiked 20 miles with 25 lbs on my back and slept at 9,200 ft. in the wilderness. I just did that. On purpose. After a light nap, an ice cream bar, a ton of water and a nap, we made the decision to section hike the Tahoe Rim Trail before summers end. 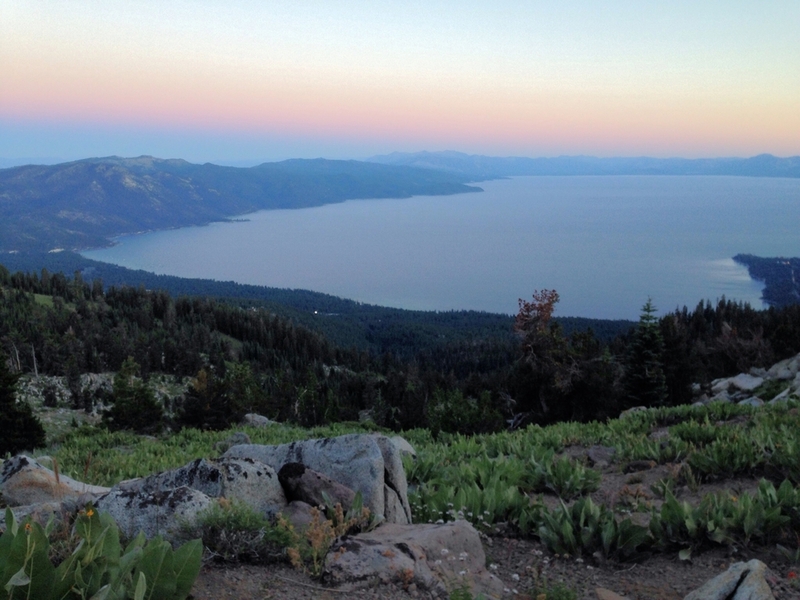 A 165-mile, twenty-four inch, single-track trail that encircles the lake. 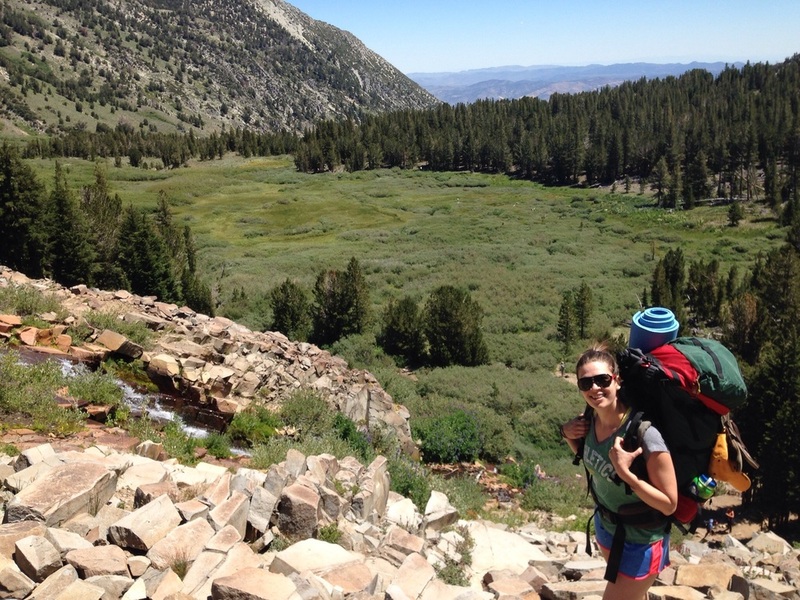 Three day hikes and five backpacking trips. Three down, five to go. Sometimes I don't really get why I love it so much. I go out of my way to carry lots of weight up mountains for miles and sleep uncomfortably on rocks. Every part of me gets tired and the hunger is unbelievable. But it's quiet. Miles away from what I'm used to. In the discomfort, it's comforting. It almost feels like I find a piece of me that has been missing. A new quiet that somehow awakes the wildness in me. It's addicting. 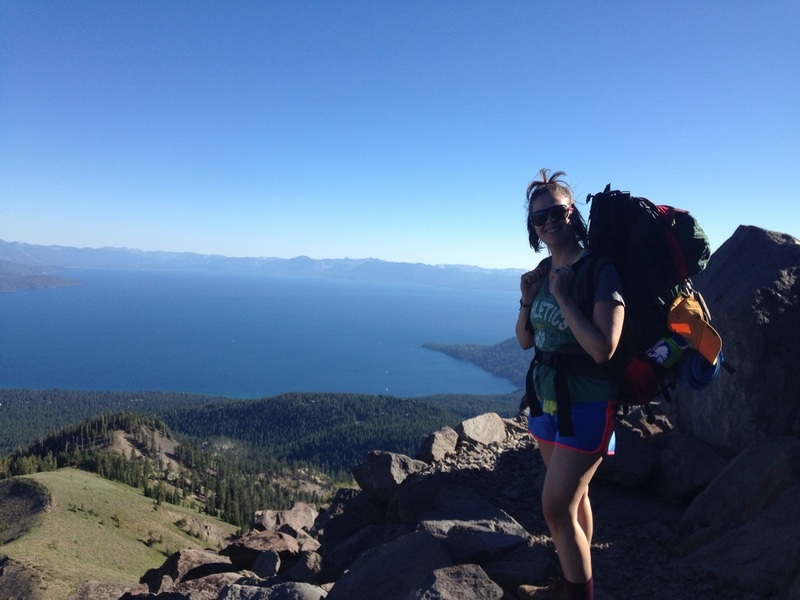 On every backpacking trip I've been on, and there have only been two, things fall apart and then come back together again in the craziest ways. It's a microcosm of life: you may work with a really difficult person, you may have spilled coffee on yourself pre-interview, but there is an epic sunset, a home cooked meal, a hug in your future that makes it all melt away. And just knowing that makes the falling apart a little easier.